We’ve moved! Agile CRM loves Hyderabad and we’re looking forward to the next years of growth in our upgraded office space in the HITEC City district. As we settle into our new offices, we’ve been thinking a lot about what it means for a SaaS company to grow sustainably, and what India’s booming tech industry is going to look like in the coming years. We bootstrapped our initial growth from a small office and we have great memories there, including the connections we made with our first 6,000 customers. But with quickly expanding product and support teams, it was time for an upgrade in terms of both facilities and location. In a way, we needed new offices that could match the rapid development of new features and enhancements in the Agile app itself. We’ll miss the old office, but we couldn’t be more excited about our new space. 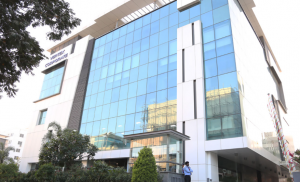 Our new office is located in the heart of HITEC City (“Hyderabad Information Technology and Engineering Consultancy” City), the central cyber hub in Hyderabad, within close proximity to some of the largest IT companies in the world. The calm, expansive surroundings are a far cry from the hustle of the other commercial localities that dot the city. What is more, the new office location lets our team take advantage of its closeness to a large number of locally and internationally acclaimed restaurants and pubs, well connected transport transit points and cultural and entertainment centers. The new office is a spacious and highly functional, a great place to get work done. Large end-to-end stationary windows overlooking the neighborhood create an atmosphere of tranquility and the minimalist interiors are replete with proportionately fitted staff cubicles and a number of glass cabins, some of which are used by the management for their individual offices while the larger ones serve as conferencing spaces. The space’s minimalism combined with being wired to the max (of course) is enabling high productivity. It’s the perfect place to concentrate and collaborate. We’ve been in the new office for about a month and it’s already starting to feel like home. Overall, the new office is a true reflection of our organizational culture. We work hard and play hard. And we’re truly devoted to customer happiness. When you love what you do, you’ll build a great product that customers love. It really is that simple. Shreyansh is a Tech blogger who writes primarily on CRM, marketing automation and digital marketing. He has more than 8 years of experience in digital marketing. He presently heads the marketing in a tech start-up company. Before I read this article I didn't know much about digital marketing company in Hyderabad. However, I think from this article I got significantly more new things about that. Much obliged to you for offering this article to us.